Edited by RecaIIer, 26 December 2014 - 01:36 AM. people need to realize that with europe, asia and the americas it is impossible to have a time that is ideal for all. that's not even including australia. I really think the planned WoE TE Time is even worse than what it is now. While it's 12 PM for GMT+1, it's still horrible for those who work on Friday. And I think this is the most part of the playerbase. So, I really, really don't get why it wouldn't be possible to shift the WoE to say, Sunday 11 am-12 am? It should be based on when players actually can play, and not when GMs have their working times and MIGHT take a look at WoE. The way you planned it right now, WoE TE is on the most horrible time there could be, and it will def. kill WoE TE. This makes sense with the current dates. I think everyone needs to take a step back before jumping on the animosity disliking woe time train. First of all, it hasn't been implemente yet. How can we really know these are bad times if no one has tried it so far. From reading this thread, seems like the times aren't working for many individual people THAT POSTED due to their work schedule or busy life style. There's a common complaint that they had adjust their work schedule to attend WoE... Well so does a lot of people and what about those that worked for them? So arguing that this new schedule won't work for them personally is selfish. Another interesting thing that I read is that pople feel WoE 1 is useless compared to WoE 2 and there is a high attendance on weekends. I'm sorry but these times aren't meant for a guild to take advantage to have higher attendance for a certain WoE. To argue that means you want WoE times to be more convenient for your guild vs the servers. Lastly, the WoE times aren't even changed that much except for WoE TE. The times for normal WoEs are the same except wednesday is a tuesday. That's not a huge change except for those who had to adjust their work or class schedule, otherwise it's the same thing. For WoE TE, I think that's a huge change for the international players but it makes sense for WoE TE to be on around the same time as the other WoEs. Edited by Demeris, 26 December 2014 - 06:45 PM. why. i don't understand why you would move woe1 into woe2s spot and woe2 into a new spot. Seriously, WoE 1 is so pointless after the WoE update. Why put that on the day when more people are active? Also, isn't this more difficult? Why not just WoE 1 to Tuesday and leave WoE 2 where it's at. So much more simple. I thought we had a discussion about these crappy times back when the server merged. Edited by Azyrk, 27 December 2014 - 02:07 AM. Shifting WoE TE's time an hour ahead to 9 a.m. PST works out to 2 a.m. the following day in Japan. TE at 2-3 a.m. on a Monday morning would be terrible for people who have to be up in a few hours. 1-2 a.m. is rough as it is for them, with many participants logging out immediately after it ends. Meanwhile, 3-4 p.m. Friday PST works out to 8-9 a.m. Saturday JST. plz change WoE te back to sunday. Edited by DeathDealer, 28 December 2014 - 02:01 PM. Yeah I'd really like to see them post up the minutes of the meeting in which they discussed the new WoE times. Very interested in their "process". Certainly not accurate or close to reality. And most likely, as others said, we were not complaining about WoE 1/2.0 times. It was the atrocious WoE TE time that made everyone facepalm. Be it the one planned or the one we have now... Even 2 hours later on Sunday wouldn't mean the worlds end. And WoE TE is NOT on the same time as WoE 1/2.0, so can you please stop with your *meep* posts and read AND(!!!!) understand what we write? Edited by Narzziza, 28 December 2014 - 12:44 PM. I don't think you understood what I wrote. I think these new suggested times are fine! Edited by Demeris, 29 December 2014 - 10:18 AM. Reviewing what's being posted here and what the preferred times that people are suggesting. The times in the OP are not set in stone. is it difficult to have a voting system implemented on the forums, where you only have a vote if your linked RO account contains a 150+ char, for example? you could even raise the limit to 155+ due to the new level cap that is in now, since a larger than 20 level difference in pvp severely gimps the lower leveled character anyway. sure some people might have multiple accounts with near max level chars, but this at least limits a mass creation of novice only accounts to stack times. you can put an npc in game or an annoucnement in game that tells people to make an account on forums to vote. 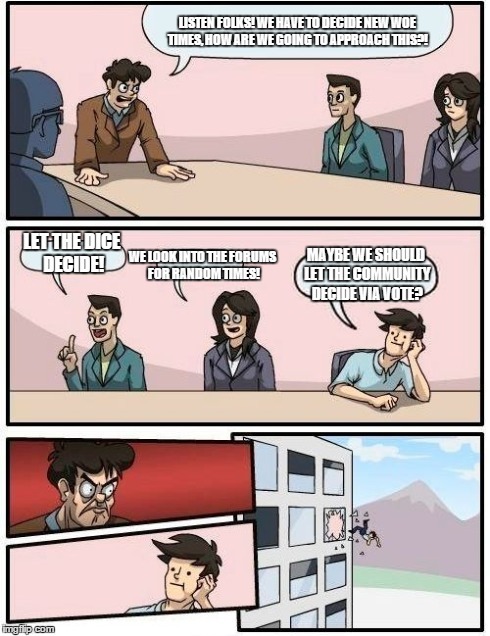 i feel that an actual voting npc in game is too readily abused, but something needs to be in game to inform people since not everyone who woes or is interested in woeing would necessarily visit the forums that often. keeping the poll results hidden until conclusion will also help prevent people just just throwing in with the largest blocs because they feel that their vote wouldn't matter if they put it for a different time anyway. I liked the original times. Being in England 12am-2am WoE times suited me fine, but I guess if I want to WoE, I will just have to stay awake longer. Well overall that works out great for Australian players! But having said that, it seems the general agreement from American players is that it needs to be later. This would also suit Australian players, as it could be 6 hours later and still suit us! So it looks like no matter what happens you have at least made Australian players happy. Edited by MrRX, 31 December 2014 - 04:57 PM. If anything, the only one that should be moved is WoE TE. Having a fixed time gives more people a chance to participate without fear of missing out in the future. With the exception of TE, in my opinion, the times should stay the way they are. The only change i'd if i had the power would be having TE @ 9-10 AM PST or 10-11. Edited by Braska, 31 December 2014 - 05:01 PM. Personally WoE Times for TE is horrible and not good. For India its again in the early Moring to 4 am and europe kinda midnight and others at working time. Please keep it to sunday and maby shift it juist +1 hour!! I think that would serve best for most pepole and not having to WoE on horrible times. I don see the use of making new Times for WoE TE when those participating cant even have a say in it ! ?